Exposure #99: N.Y.C., 401 Broadway, 02.17.12, 6:38 p.m. Traditional photography provides the viewer with a single, privileged viewpoint: that of the photographer him/herself. 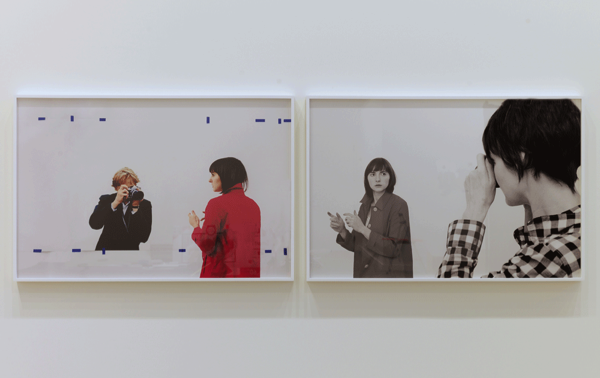 In Barbara Probst’s practice, several cameras are placed around the subject at various viewpoints, each triggered simultaneously via radio-released shutters. The resulting images are exhibited together as one piece, representing a single moment in time. As Probst explains, “A camera is like an eyewitness and a photograph is like a witness’s account. Eyewitness accounts of the same event can be surprisingly discrepant….But what, actually, is the ‘reality of an event?’” Probst’s Exposure series encourages the viewer to synthesize the information provided in the images and mentally reconstruct the depicted space. Not unlike viewing sculpture in the round, the viewer can access the work from multiple entry points, opening up infinite possibilities for interpretation.